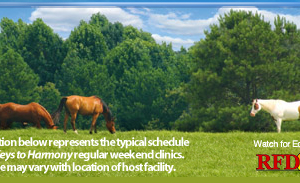 Both you and your horse would greatly benefit from the clinic experience. Much of what you'll learn and what you'll be teaching your horse during the weekend centers around developing your leadership position in your relationship with your horse. You do not need to be an experienced rider or horseperson to participate with your horse in this clinic. Beginners as well as advanced riders have found the skills taught in Ed's clinics to be very useful. His system of working with horses builds confidence in handling horses on the ground and mounted, equips owners with natural communication skills and establishes their authority as a confident, consistent leader for their horse. 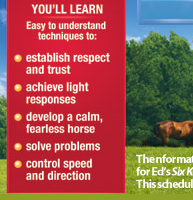 Ed's teaching style is very clear and straight-forward, giving students a methodical and systematic approach which is easy for both horse and rider to understand and apply. His gentle methods have been proven effective by successfully working with hundreds of horses and humans. You will learn problem solving principles and teaching techniques that work with the horse's nature and instincts in order to overcome resistances with confidence, patience and understanding. Friday night will be a lecture and demonstration on the history of natural horsemanship and why this systematic approach works with great success for horses and humans. We'll also show some good practical techniques for catching, haltering, tying, saddling and bridling. Sunday morning we'll review what we did on Saturday and you'll find that both of you are doing all the exercises much more smoothly and lightly than you did on Saturday. Sunday afternoon we'll apply the Six Keys mounted to improve riding skills and achieve safety and good control of speed and direction. You'll have an easy to apply skill to absolutely stop him and shut his motor off whenever you need to. He will be at peace under your confident leadership. Monday and Tuesday following every clinic, Ed will be available for private or group lessons. This is a great opportunity for you to have a private session to follow up on the skills learned during the clinic. 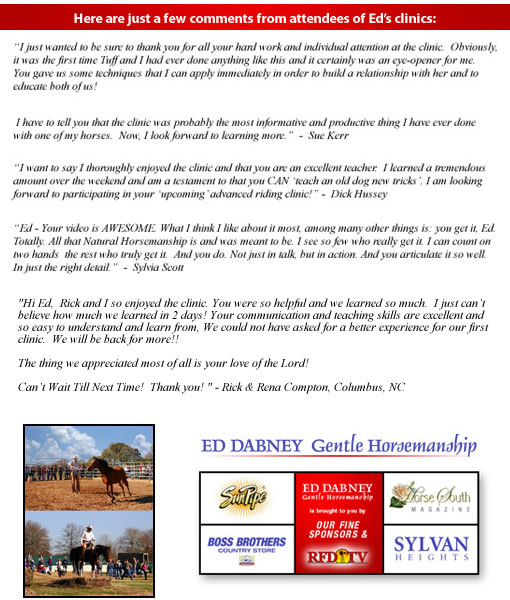 Ed will be happy to work with you and your horse on particular problems or the issues that are most important to you. Private sessions are $85 per hour and may be scheduled throughout the day. If there is a group of participants who would like a follow up session on Monday or Tuesday to all work on similar topics, group sessions are $50 per hour per participant. Easy to understand techniques for establishing respect and trust with your horse and achieving light responses from your horse on the ground and mounted. Overnight horse boarding is usually available. Please contact us for information.